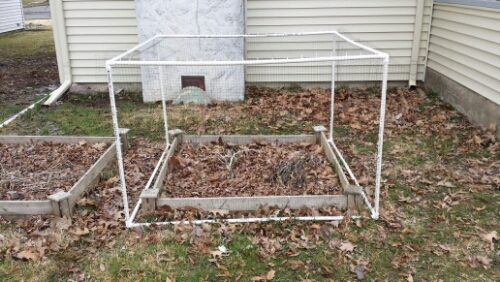 In previous years, we protected our crops from the squirrels, rabbits, and birds by draping the plants in netting. It worked well enough but became a little inconvenient when harvesting. Moving and replacing the netting every day was a hassle, plus the netting sometimes got stuck in the growing plants, making moving it impossible. 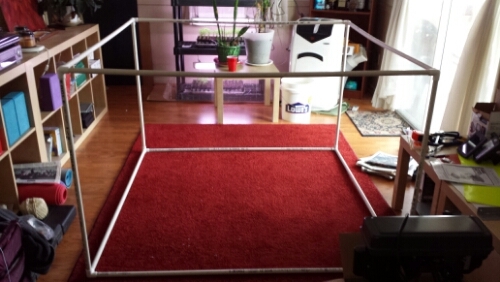 So last late year, we decided to go a different route this year and build moveable and modular net cages, at least for smaller raised beds. (The long beds are another matter.) Think of a hollow cube covered in netting, and that’s what we we aimed for. Yesterday, we completed the first prototype (inspired by as few designs we found online), and it turned out pretty good! 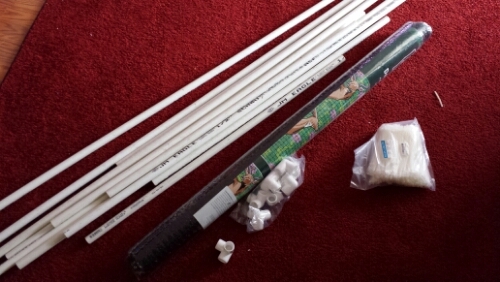 First thing we had to do was get the supplies: netting, 1\2-inch PVC pipe, 1\2-inch PVC corner joints, and zip ties. 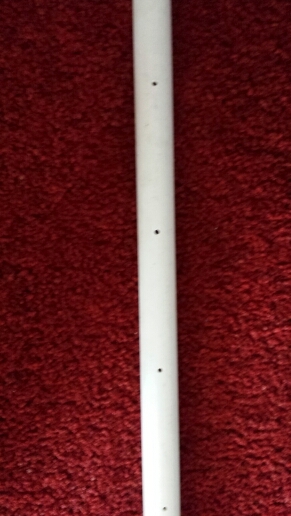 We previously ordered the netting, corner joints, and zip ties, which left the pipe to obtain from the hardware store. Living close to a hardware store is a great thing, especially when one has to transport a load of 10-foot-long PVC pipe in an 8-foot-long car! With the supplies all ready to go, the first thing to do was to measure one of the raised beds. After getting the width and length — 56 inches both — and deciding to make the thing 36 inches high, we cut the pipe to length. Cut pipe and everything else ready to go! 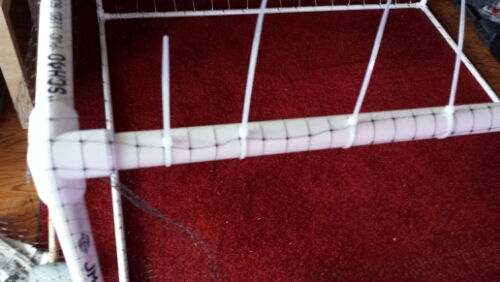 Next we drilled holes into the top and bottom struts for the zip ties. The joys of having a drill press. Then we dry fit the whole thing just to make sure that nothing was horribly off measurement-wise. It didn't seem like it'd be this big when we started! With things looking good, it was on to attaching the netting, which we did using the zip ties. The ties go through the pipe to hold the netting securely. In order to maintain the modularity of the cage, we draped and attached netting over one side, over the top, and down the parallel side. For the other two sides, we cut individual pieces of netting and attached them to the top and bottom struts, but not to the side struts. So the cage comes apart in three sections: two side pieces and the side-top-side section. Does it work? Well…once we got the whole thing together in the house, we took it apart and took the prices outside where we reassembled it. The results? Not half bad! Made in a single day, hardware store trip included. It fit perfectly over one bed. Now, we have to make one more just like it for another raised bed that will hold low plants. Then we have to make a couple different variations for the other two beds that hold taller plants like peas and cucumbers. In other news, while we we at the hardware store, we picked up several blocks for our second stone bed. The start of big things. 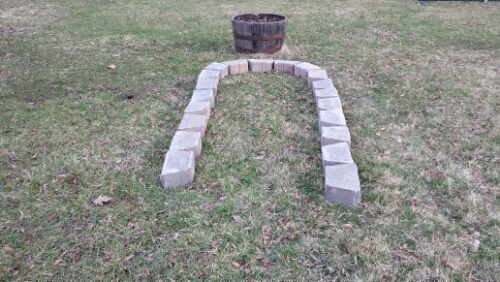 Once complete, it’ll run parallel to the stone bed we built last year. But we have a few more hardware store runs to manage before this bed becomes a reality. Not only that, but its still too cold to work outside for any length of time. Hopefully a warm-up is in the future, because we need to get all the garden prep done soon! Smart! I need to make something like that. I’ve already seen a few rabbits hanging out in the garden yard. Thanks! The one we made (now two, as we just built another one) went together pretty easily, and it wasn’t as time consuming as we thought it might be. Since putting the cage in the yard, we’ve seen a few curious squirrels check it out, but that’s about it.